We are accustomed to conquests of civilization. It seems there is nothing surprising when to flip the switch, and the lights come; you press the button - and you substitute a person under the cool breeze generated by the fan blades; stick a fork into a socket, and iron in a matter of seconds heated to the desired temperature. It's hard to imagine that in ancient times people did not know electricity. And maybe they'd still like to know? .. The last millennium, and already the Greek philosopher Thales of Miletus purposefully put a variety of experiences with the "electronic", which in Greek means "amber". We know about these unpretentious experiments not too much. More or less known that the philosopher grind a variety of amber figurines - rods, plates, balls and cubes, which are then rubbed all sorts of tissue, skin and hair. So he studied the "kinship" of objects and materials, and "the divine power of the electron." For a long time it was believed that it was the only (excluding lightning) familiarity man with electricity, but the history of loves surprises. Once in 1936 during the construction of the south-eastern section of the Baghdad Railway workers stumbled upon an ancient Parthian tomb. It was found yellow-brown clay vessels two thousand years ago-it. Inside were rolled into a cylinder of copper sheets, corroded iron rods and pieces of bitumen - natural asphalt. It seems that the bitumen covered top and bottom of the copper cylinder, which was placed inside an iron rod. Bitumen sealant and corrosion suggest that in the vessels was some kind of caustic liquids such as wine vinegar. So, maybe, we have a real battery? That's what the director of the National Museum of Iraq, Wilhelm Konig. This prominent archaeologist came to a sensational conclusion that the contents of the vessels is very similar to the galvanic cells. However, most archaeologists believe that here they just came with the usual case for storage of papyrus scrolls, because similar artifacts have been found near the city of Seleucia on the Tigris and the capital of the Parthian Empire Ctesiphon. There's a "Seleucia vases" have found a roll of papyrus, and twisted sheets of bronze, is more reminiscent of a container for folded sheets of papyrus. In "Seleucia vases" could be kept sacred scrolls of parchment or papyrus, which recorded some ritual texts. During their decomposition could stand organic acids, corrosive copper and iron, which explains the corrosion on internal metal parts. In this case, bitumen sealant "allows you to store the contents of the jug for a long time. Sensationalism possible use "of Seleucia vases", despite the objections of academic scientists, triggered a wave of interest in the "electric" artifacts. 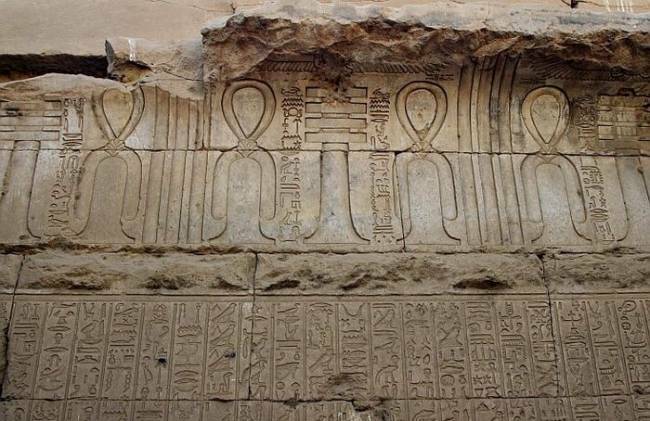 Enthusiasts exploring the mysteries of the ancient Egyptian "Temple of Science" by Peter Krass and Reinhard Habeck even wrote the book "Light of the Pharaohs," which examined the question of the use of electricity in ancient times. 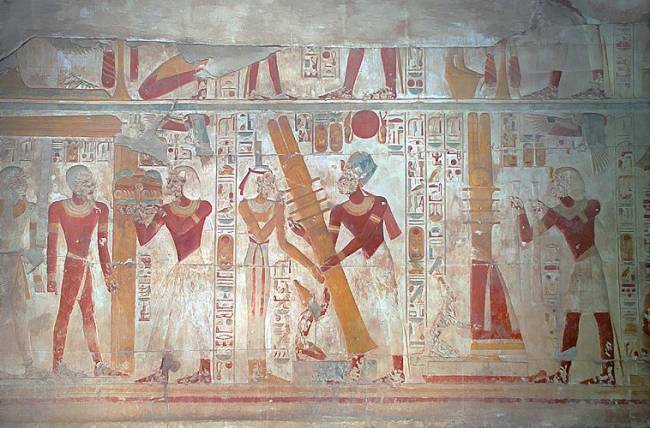 They suggested that the "temple scientists" were part of the priestly caste, were able to produce some "djed-pillars", one of the components of the power system. The authors also claim that during the excavation of the pyramids have been discovered every model "spotlight" with copper wires. Research findings "light Egyptian" is based on the ancient Egyptian temple of unusual frescoes. 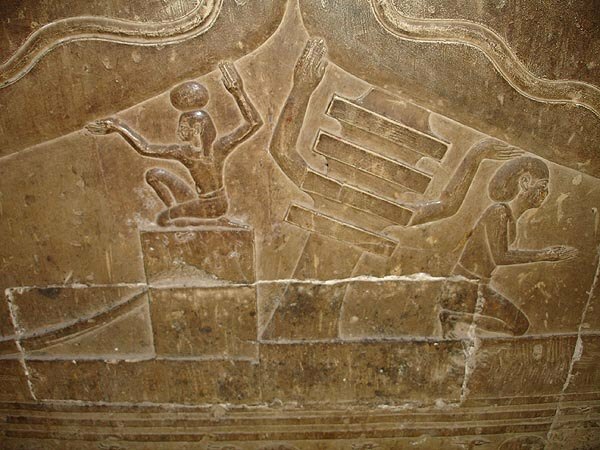 First of all, here stand the mysterious underground bas-reliefs of the temple of Dendera.In one of the stone chambers of unknown purpose depicted human figures around with some objects shaped flask. These flasks, or bubbles, very like giant light bulbs with bizarre writhing snakes inside. Head crowned with lotus flowers snakes, something reminiscent of lampholders. 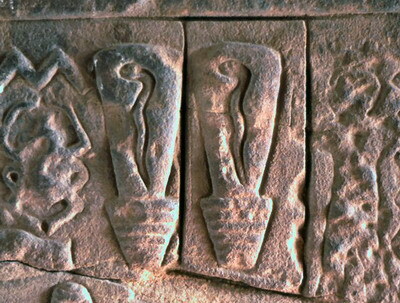 Something like a cable is connected to the box, which is located near the symbol of power - "djed pillar", also bonded with snakes. 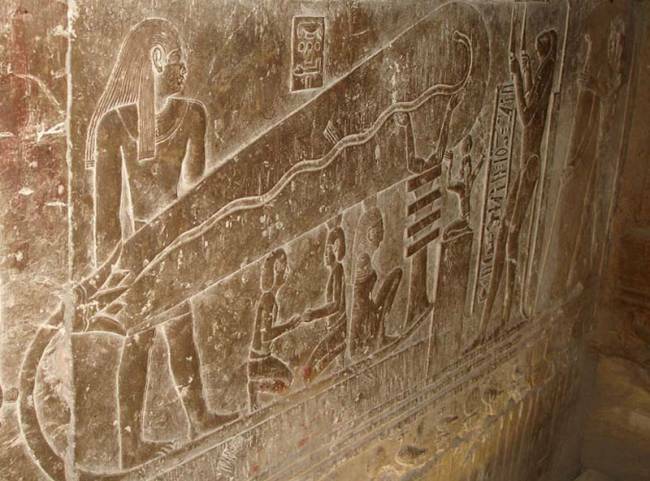 However, a large dose of imagination is needed to represent the servants of Pharaoh, each holding some mysterious devices resembling lamps or spotlights, connected by wires to a number of vessels-batteries. There are critical arguments, because the image is accompanied by a Chinese character of a religious hymn dedicated to the sun god - Ra. This allowed the Egyptologists reject all informal hypothesis and confidently explain the icon image of the temple with the heavenly mysteries rook sun god Ra.According to the beliefs of the Egyptians, the sun die every day in the evening and rises at dawn. Here it symbolizes the snake, which is considered the country's Pharaohs reborn whenever sheds its skin. Incidentally, the German physicist Frank Derenburg calculated parameters of the battery on the "Baghdad version," and it turned out that such an arrangement for lighting Egyptian dungeons should weigh tens or even hundreds of tons. Which is clearly contrary to common sense. 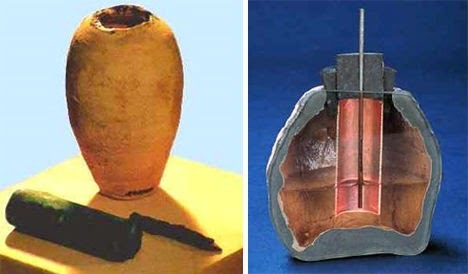 On the way to solving - "living batteries"
Riddle of "Baghdad Battery" and "Egyptian electricity" can be solved by surprise. Historians of medicine of the ancient world known paradoxical methods of treatment with the help of ... "animal electricity." In principle, there is nothing unusual, as individual members of the Nile electric som really capable of hitting 400-volt pulses with voltage current, which is very important for the modern electromedicine. There are descriptions of European ethnographers XVIII century that the same Abyssinians in an unusual way and very successfully used the "electro-shock therapy." During severe attacks of swamp fever they are tightly tied to the wooden platform of the patient, doused it with saline brine (salt water lakes.) And touched his navel live electric catfish wrapped in dry papyrus. Electric shocks followed up until febrile seizures did not stop. By the end of the XVIII century of British doctors and biologists became popular theme of "living electricity". Anatomist John Walsh proved the electrical nature of hitting the ramp, showing that electrical impulses are not transmitted "air fluids", and the direct contact and "affinity conductive substances." Then the Scottish surgeon John Hunter examined the structure of the electric organ of this unusual fish. Studies Walsh and Hunter were published in 1773 and a few years later came to the Italian physician Luigi Galvani and physiologist. Galvani began experimenting with static electricity. Once his assistant accidentally touched the frog's legs with a scalpel, has accumulated electrical charge. Foot twitched convulsively, and before Galvani opened a new area of ​​research. Catching up on "animal electricity," Galvani made findings that muscles are original batteries, which means electrical signals controls the central nervous system. Using the famous medical principle of "like - like", he suggested that many muscle diseases, cramps and "cramps" could be treated with electric shocks. So, maybe, and low-voltage Egyptian and Sumerian "appliances" had a medical purpose? This seems possible with electroacupuncture procedures when biologically active points (BAP) is fed small current pulses. Incidentally, electrostimulation on BAT can also lead to analgesic effect. So there or not "electric" artifacts, historical science does not yet know, because after the death of the Library of Alexandria disappeared thousands of papyrus scrolls that hold the secrets of "the temple of science." 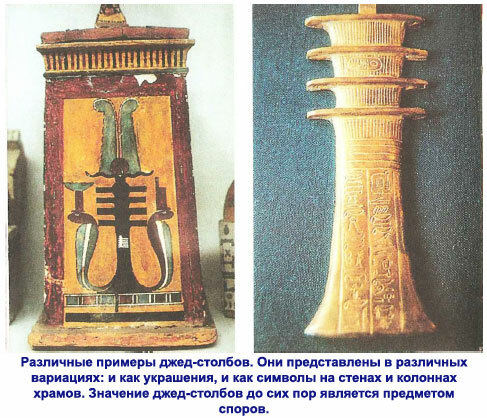 Maybe we are still waiting for a very unusual archaeological finds "kriptoelektricheskih" artifacts, which will open new pages in the history of science and technology.